The 8th Hue Fe stival with the theme “Cultural heritage with integration and development” will take place from April 12 to 20 next year, according to organisers. The information was revealed at a press conference held by the Ministry of Culture, Sports and Tourism in conjunction with the Ministry of Foreign Affairs (MoFA) and the Thua Thien-Hue provincial People’s Committee in Hanoi on December 12. The festival, which brings together ancient capitals in Vietnam and some other countries, will be a special cultural activity in the framework of the East Asia-Latin America Culture Exchange initiated by the MoFA. A meeting of the ASEAN Ministers Responsible for Culture and Arts (AMCA) and the AMCA Plus Three Meeting (plus Japan, the Republic of Korea and China) will take place in the city during the festival. According to Deputy Minister of Culture, Sports and Tourism Ho Anh Tuan, a ceremony to honour the Hue as a city of culture and arts will be held as part of the AMCA meeting. 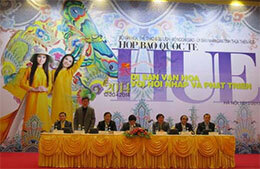 The 8th Hue Festival will include large-scale activities related to culture, tourism and arts. Exhibitions, kite performance, art performance, science workshops, trade and tourism fairs, sport events and the performance of culinary art will be held at the 9-day festival. The event is expected to draw about 200,000 visitors, with half of them are foreigners. Over 500 accommodation establishments in the city with the capacity to serve simultaneously 20,000 people are ready to welcome festival-goers.